It’s time . . . I’ve held off as long as I can. It’s definitely time for some pumpkin recipes! 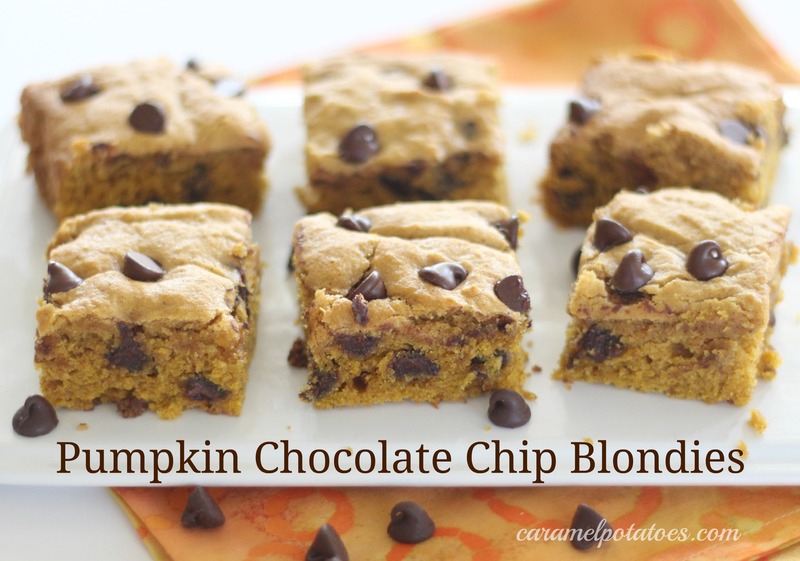 These Pumpkin Chocolate Chip Blondies are so good and so easy to make – a perfect way to start the pumpkin parade this year. 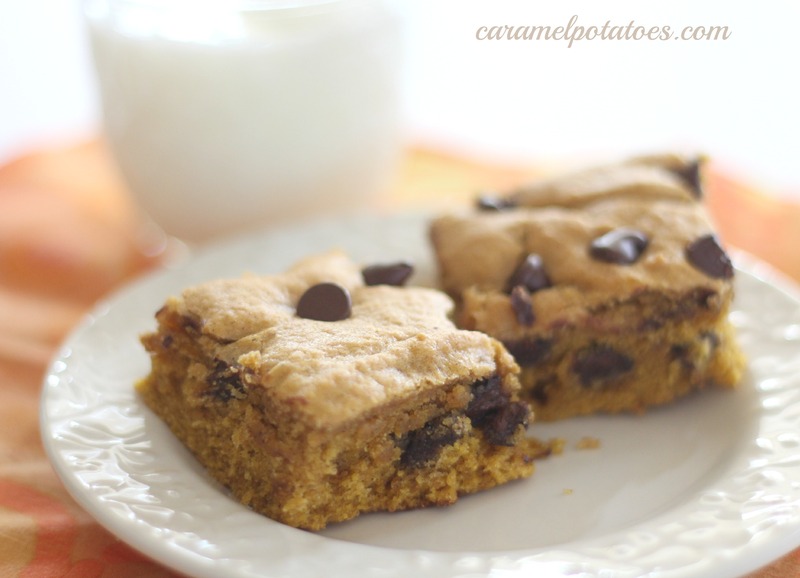 This recipe makes a 13 x 9 pan of a moist and delicious pumpkin bar complete with all the right seasonings. 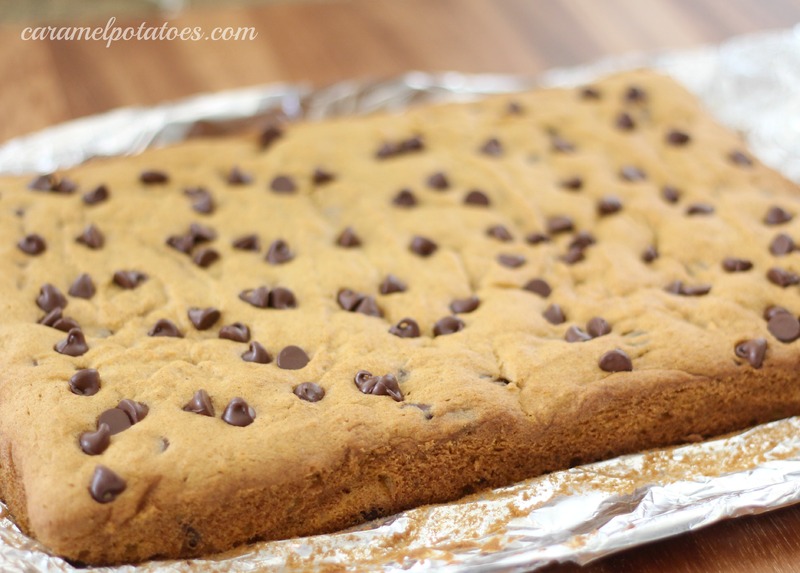 Throw in some chocolate chips to finish things off and you get a wonderful taste of fall! Hint: If you line your pan with foil, you can lift the bars right out of the pan for easy cutting. With an electric mixer, cream butter and sugar on medium-high speed until smooth; beat in egg and vanilla until combined. Beat in pumpkin puree (mixture may appear curdled). Reduce speed to low, and mix in dry ingredients until just combined. Fold in 1 cup of the chocolate chips. Spread batter evenly in prepared pan. Sprinkle remaining chocolate chips over the batter. Bake until edges begin to pull away from sides of pan and a toothpick inserted in center comes out with just a few moist crumbs attached, 30 to 35 minutes. Cool completely in pan. Oh I bet they just melt in your mouth!